Laminate flooring is extremely popular for many reasons. Laminate flooring can be every bit as beautiful as other flooring types, yet it is significantly less expensive than most and much more durable. Laminate flooring is often made to mimic hardwood floors, but its anti-scuff and abrasion defense make it a viable alternative. 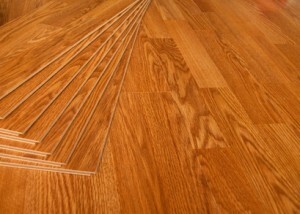 Laminate flooring also is made with an interlocking tongue-in-groove system that makes for easier installation. So, with laminate flooring you get the look that you want for less money and less time, that will also last longer with less maintenance. For the best in laminate flooring you can find, call the flooring experts. We work with the finest manufacturers, so we have a vast selection of style, patterns, colors and types of laminate flooring. Our installation technicians are also professionally trained and highly skilled so they are capable of quickly and efficiently installing your flooring. We always extend prompt and courteous service on every job, and that is why we are the preferred choice for laminate flooring. Laminate flooring is a prime example of what advancement in flooring technology looks like. This flooring is able to mimic many other materials because it features a high resolution print as the top layer. That print perfectly displays any number of flooring types, mostly hardwood, in such detail that it looks like the real thing. That means you can have any finish, color or even material type you want in your flooring. There are also stone and ceramic tile options in laminate. One of the biggest appeals to laminate flooring, besides its affordability, is its durability. Laminate is extremely resistant because the top layer is sealed with a tough resin based coating. Laminate flooring is also relatively comfortable to walk on. It has three layers to it, the middle “core” layer being a high density fiberboard that absorbs impact. Installation is a breeze with the interlocking grooves that require no nails. This makes install times fairly quick, which cuts significantly on labor costs. There are even mess free “glueless” laminate types for simpler installations. All in all, laminate flooring has a lot to offer. If you would like to explore what it could do for your home, call the flooring experts for an estimate. We’ll send you a designer to consult with and discover the right laminate flooring for your needs.